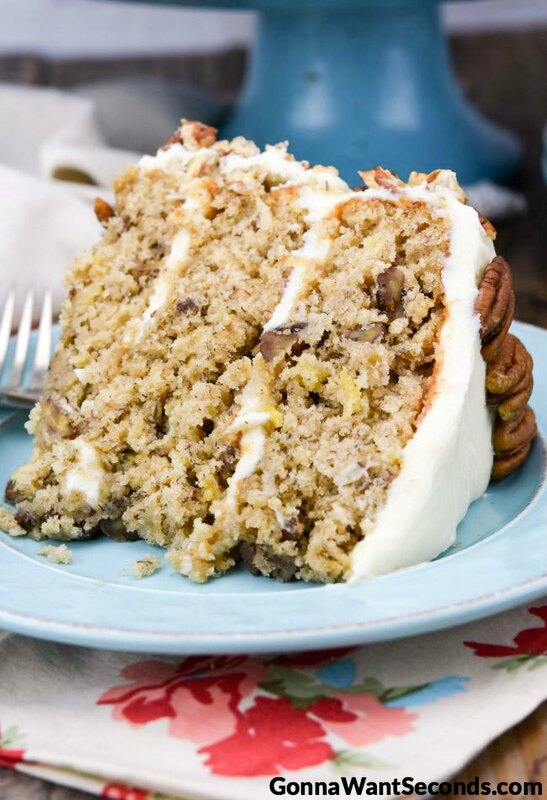 Skip the boring banana bread and breathe new life into that overripe fruit with this tropical Hummingbird Cake recipe. The Caribbean is calling, and this cake is the next best thing! “If you build it, they will come,” has worked exactly (at least) two times in history: once in a Kevin Costner movie and once for the tourism board of Jamaica. It may be hard for those of us who dream of Montego Bay beaches to imagine, but in the 1970s it wasn’t exactly a tourist hotspot. In an attempt to bring more flights and full wallets in from its northern neighbor, Jamaican brainstormers decided to capture North American hearts by way of their stomachs. And we all know that gamble paid off. The Hummingbird Cake history is just that simple. A few carefully placed ads and press kits intrigued culinary adventurers, and it wasn’t long before this dense, fruit-filled, tropical confection became a sweet kitchen staple, particularly in the South. The name itself evolved from the original Jamaican title of “Doctor Bird Cake,” “doctor bird” being a variety of hummingbird native to the island. Maybe it got its name because of all the sweet ingredients reminiscent of the sugary nectar hummingbirds are drawn to, or maybe it’s a nod to the name of the first person who brought all these ingredients together. Regardless, the Hummingbird Cake is one you either already know about or will soon be wishing you’d discovered a long time ago. The popularity of this cake state-side started with the Hummingbird Cake Southern Living published in 1978. To this day, it’s the most frequently requested cake for that publication. I think it may also be the heaviest cake I’ve ever made, and when you review the ingredients you’ll understand why. The fruit and nuts take up more retail space than the flour in this recipe! What fruit? The same two you think of mixing into a lovely rum drink on that Jamaican beach – pineapple and bananas. We all know how moist and flavorful smashed bananas make cakes and muffins, and pineapple adds additional moisture along with that slightly acidic quality that makes it such a unique flavor. Toasted pecans, warm cinnamon, and a touch of vanilla round out the flavors in a pretty standard cake batter leavened with just a touch of baking soda. The result is a cake with a coarse but open crumb studded with fruity nutty goodness. You wouldn’t think of frosting this cake with anything but a cream cheese frosting, right? The touch of tang in the cream cheese balances the whole cake that, along with a generous garnish of more chopped pecans, succeeds on a satisfaction level way off the chart. You know this cake has a reputation for being extra special if it’s a favorite of TV superstars. The hummingbird cake Oprah (yes, Oprah) frequently requested from her personal chef Art Smith is definitely a classic (apparently he even made it for Maya Angelou’s 75th birthday). 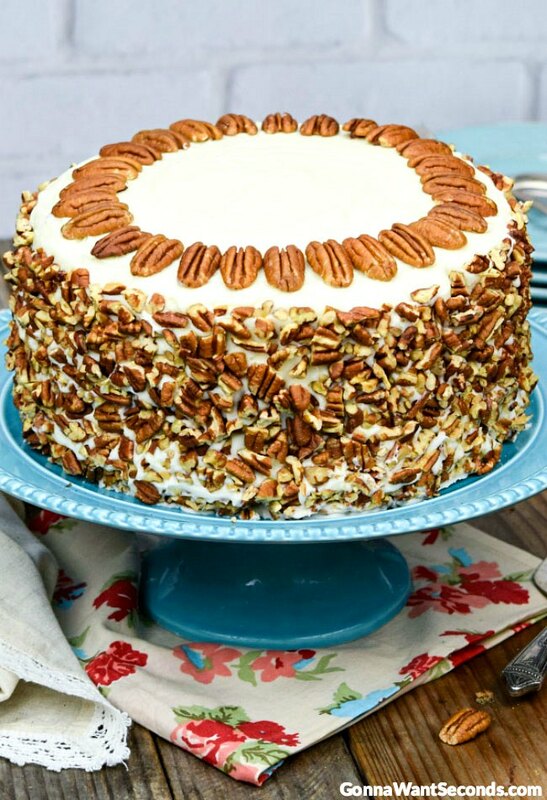 Chef Smith’s recipe is missing two ingredients, though, that I like to include in my cake – pecans and baking soda. The pecans add so much texture and flavor, especially when toasted, and the baking soda helps to take it from dense to delectable. 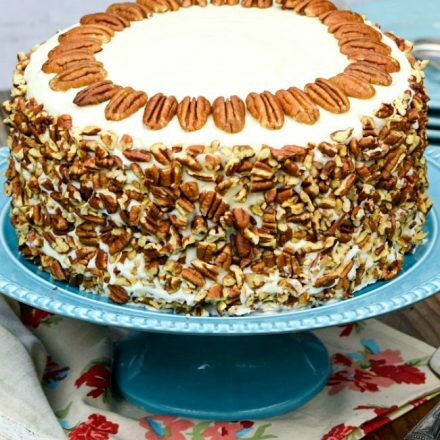 The hummingbird cake Paula Deen, the expert on sweet tea and all things Southern, makes uses butter instead of oil, includes a healthy splash of buttermilk, and also skips the pecans. While I’m obviously not going to turn down a slice of this cake, I prefer the airier, moister result from my oil-based recipe. Although butter and buttermilk add richness to cakes, it’s hard to appreciate the subtleness of that characteristic behind all the strong flavors of the other ingredients anyway. Paula garnishes her cake with coconut, which is a deviation from the original as well. For fans of that chewy tropical treat, though, feel free to check out the hummingbird cake recipe with coconut made by none other than Martha Stewart. While I love using coconut in lots of recipes, I feel like it takes over the flavor and texture in a lot of dishes, so I skip it in my Hummingbird Cake. Next time you’re staring at a few ripe bananas on your counter, wondering whether they’ll make their way into some tasty baked good or ultimately find a home in your compost bin, give this classic Hummingbird Cake a try. I promise you’ll be humming just like those little birds when you take your first bite! Preheat oven to 350 degrees. Line the bottom of 3-9 inch round cake pans with parchment paper. Grease and flour pans. In a large mixing bowl, whisk together the first 6 ingredients. Add the bananans, oil, pineapple, eggs, vanilla, and pecans and stir just until the dry ingredients are moistened. Pour batter into prepared pans. Bake in preheated oven for 28-30 minutes or until a toothpick inserted into the center of the cake comes out clean. Cool in pans for 10 minutes. Turn cakes out onto wire rack and cool completely about 1 hour. In a medium mixing bowl, using an electric mixer beat together cream cheese and butter until smooth. Gradually add powdered sugar, beating on low speed, until combined. Add vanilla and stir to combine. Place the first layer of cake on a serving plate. Evenly spread one-fourth of the frosting over top. Repeat with remaining layers. Spread the remaining frosting over the sides of the cake. Press 2 cups chopped Pecans onto the sides of the cake. Refrigerate overnight. No more layers: I know we don’t always have the time or patience to deal with frosting a layered cake. You can turn this into a hummingbird sheet cake by baking it in a 9”x13” dish (lightly greased or lined with parchment paper) at 350 degrees for 50 – 60 minutes, or until a toothpick comes out clean. If you want a hummingbird Bundt cake Check out my recipe HERE. Yes, it’s also a Southern Living Favorite! 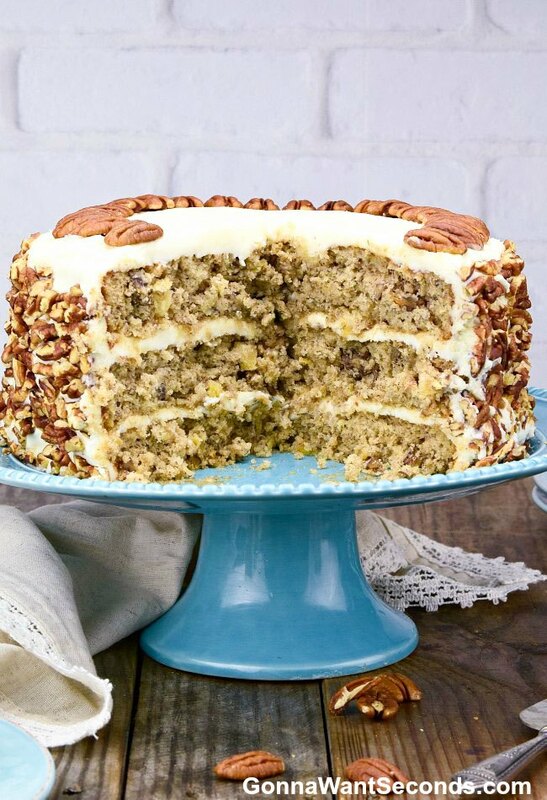 Toasty: You should almost always toast pecans before using them, and this cake definitely benefits from the few extra minutes. I prefer to do them in a skillet on the stove top, over low to medium-low heat, tossing them around just until they’re fragrant. I’ve been known to forget about them once or twice when trying the oven method. Be sure to toast them whole, then chop them, to help prevent burning and make sure they chop without too much flaking. Pineapple Flowers: One of my favorite garnishes for this cake is dried pineapple flowers. They’re beautiful and unique and will make your cake stand out against even Ms. Deen’s! Heat your oven to 225 degrees. Chop off the top and bottom, then peel a fresh pineapple, cleaning the edges until none of the little brown bits are left. Cut thin slices and place them, in a single layer, on cookie sheets lined with parchment paper or Silpat liners. Cook for about 30 minutes until the tops look dry, then flip them to dry out on the other side for another 25 to 30 minutes. It can take a bit longer to look really dried out – just watch them carefully so they don’t burn. As soon as they come out of the oven, I like to drape them over the back side of a muffin tin so they make a perfect cupped flower shape. You can store them in an airtight container in the fridge for about three days if needed. Apple Dump Cake Recipe -This cake is infused with tender fruit and a rich, buttery cake covered with crunchy crumbs! Banana Pudding Cake– Our Banana Pudding Cake is an incredibly moist three-layer dream cake with a cream cheese pudding filling, lots of bananas, and a luscious frosting.